Grand JunctionGrand Junction — A citizen petition was submitted to Colorado Parks and Wildlife requesting the overlapping of archery and muzzleloader seasons be eliminated in the late summer for safety reasons. — A citizen petition was submitted to Colorado Parks and Wildlife requesting the overlapping of archery and muzzleloader seasons be eliminated in the late summer for safety reasons. Grand Junction — A citizen petition was submitted to Colorado Parks and Wildlife requesting the overlapping of archery and muzzleloader seasons be eliminated in the late summer for safety reasons. The petition was submitted after a bow-hunting accident killed a Palisade teenager. Justin Burns was shot and killed by a muzzleloader hunter on Sept. 13. The teen’s grandparents also submitted a letter to Parks and Wildlife requesting the elimination of the season overlap. After a short discussion at its monthly meeting on Jan. 13 in Denver, the Parks and Wildlife Commission denied the petition. 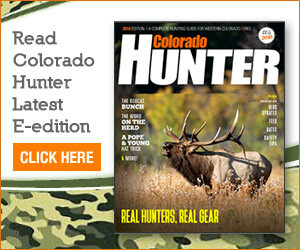 Tom Behunin, representing the Colorado Bowhunting Association, spoke against the petition. Behunin said hunting can be a hazardous sport but added he can remember only two fatalities between archers and muzzleloader hunters during the past 35 years. The people who submitted the citizen petition were not at the meeting. The Parks and Wildlife commission had two options: Move the petition forward or deny it. At the meeting, commissioner Robert Bray said it’s always good to have a dialogue when looking at the seasons, but he didn’t see the need to approve the petition. “We just went through the five-year season structure, and every time we discuss all these various options, and we’ve never come up with a solution that would separate the seasons, and I don’t see an overwhelming reason to do so,” he said. The commission was unanimous in voting down the petition. Because the commission had just approved the season structure for the next five years, a similar petition concerning the overlapping seasons can’t be submitted again until 2019. In 2015, the Western Slope archery season for a variety of big game animals ran from Aug. 27 to Sept. 27. The main muzzleloader season on the Western Slope was Sept. 12-20. Bear seasons for rifle and archery were Sept. 2-30 last year. Guy Leslie Pohto, 59, of Cook, Minnesota, is charged with reckless manslaughter in Burns’ death, which occurred near Big Creek Reservoir on Grand Mesa. Pohto is expected to enter a plea on Jan. 27, and he also is facing a civil wrongful death lawsuit in federal court. The Citizen Petition Policy gives any interested person the right to petition and have the Parks and Wildlife Commission vote on rules and regulations.